Along with soothing heat, a FIR sauna provides quite a number of therapeutic health benefits. A far infrared sauna home therapy regime can be effective in the treatment of problems such as sub-acute and chronic inflammations, nerve pain and fibromyalgia pain, as well as assisting with weight loss, boosting the immune system, improving joint flexibility and detoxification of the body. During a 20-minute FIR sauna session your heart rate can increase by 50% or more. This therapeutic time in a far infrared sauna provides the same metabolic result as if you had done physical exercise equivalent to a brisk walk. While the traditional sauna offers high heat and steam therapy, the far infrared home sauna actually uses a lower, more pleasant temperature as it penetrates the body deeply, causing you to sweat more profusely. 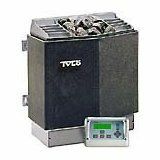 The temperature inside an FIR sauna is around 110° - 130°F (43° - 54°C) versus up to 180°F experienced in a traditional sauna so it is more comfortable for therapy sessions. The temperature you feel is actually a wavelength of light warming your body without warming the air between you and the source. It is known as radiant heat or more correctly Far Infrared Energy (FIR). 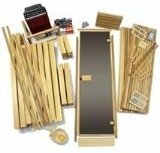 Ideally, a professionally designed far infrared heated sauna is the best way to achieve the health benefits, but you can also find FIR tents, domes, and bags which can give you an introduction to the therapy without spending a lot of money. You might also want to take a look at the Infrared Full Therapy Mat which is one of the more interesting new products on the market. 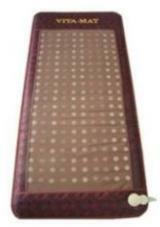 The FIR mat helps alleviate the conditions of arthritis, joint pain, and stiffness. It takes just minutes to heat up to temperature, and the user will experience deep relaxation as the mat melts away muscle tension and stress. Just lie down on the mat and let the infrared effect hit your body directly. To work effectively, a far infrared or FIR emitter must be directly in front of you and aimed right at your body core. You can not detox in a FIR home sauna any other way. 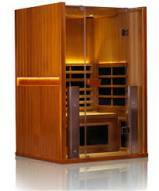 Emitters aimed at your trunk and legs aren’t doing much good, and if you come across an infrared sauna cabinet which has no emitters in front - don’t buy it. These are adapted from traditional hot rock designs with lovely full view doors and windows but they are not designed well for the aim of infrared rays (which remember don’t bend or bounce off walls, they travel only in a straight line). Educate yourself to FIR technology and beware of the cheap far infrared products flooding the market from China. It’s a problem that is becoming so prevalent in fact that the Ontario Fire Marshal put out a warning on these poorly designed and manufactured infrared saunas. 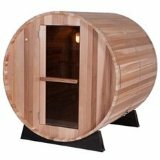 There are several excellent makers of these FIR sauna units on the market and we cover many of them on this website.